The goblin is no friend of Tally’s! Miss Tally has now been introduced to the bag goblin several times. Each time it’s “new” to her – but she admittedly takes less time to settle each time. But, simply aiming it at a different body part makes it “take a whole new shape”. This will be a long journey with Miss Tally! Feeling a little perverse this past weekend, and more than a little curious, I decided to introduce each of the horses to the bag goblin. I found the results amusing, if not all that surprising – each horse’s reaction was a near perfect metaphor of their innate personality. Tally, the flighty. As I said, Tally’s response is the perfect example of a flight animal. Shake the bag and she does her best to spin and leave – with no intention of coming back! With the help of carrots, and soft words, she is slowly learning more control over those impulses. Trouble is, you never know when she will revert. Bounce the bag all over her and she might be still; but just one move in precisely the wrong direction (and who knows what that is at any given moment), and she looks for all the world like a mountain lion is approaching! It will be a long winter of desensitizing before we see if she will ever learn to just relax. Noble, the warrior. This young man’s response was fascinating – and proof that my boy is a fighter! Because we’re still trying to deal with his pulling on the halter, I dared to introduce him to the goblin while at liberty. His response began as Tally’s – only he had the freedom to actually spin and run away. But that’s where the similarity ends. Once at a safe distance, Noble spun to look back. Head high, softly snorting, he then marched right back up to the goblin – neck arched like a stallion ready to fight. He gave it a good sniff, then turned to me to receive his reward for bravery. At each shake of the bag, the scenario would repeat – with the distance shorter, and the return time faster – until he finally tired of running away and would just wait for his carrots. Nash, the old campaigner. I introduced the goblin to the old man, purely on a whim. He was standing there, and so was it. Normally one to take things in stride, he can nonetheless take a turn and decide to suddenly be silly about the slightest thing. So, I didn’t know what would happen – especially now that he has only one fully functioning eye. I shook the bag in his face. He took one rather bored look at it, then turned to look at me. I’d swear that if he could talk he would have been saying, “Yeah, so?” He never bothered to even look at it when I shook it again … he simply stuck his nose on the treat pouch! Coffee, the class clown. Leave it to Coffee to bring comedy to the whole thing! Shake, shake, shake … must be a toy! Not only was he not in the least bothered by the silly bag – he followed it all around with his nose. He’d bury his nose in the bouncing plastic, giving deep sniffs as he pushed it around. I have no idea what smells he was getting, but in the next moment he tried to eat it! In fact, he then got so focused on trying to take a taste of the bag we had to stop! Undeniably, horses are prey animals whose natural defense is flight – as most Natural Horsemanship trainers like to remind you (and take full advantage of). But after a long history of domestication, it’s an oversimplification to characterize them that way. They have individual personalities, as varied and complex as the people you encounter everyday. Introducing them to something completely new and unexpected can tell you a lot about their personalities. Our little herd is a perfect illustration, with each having a very unique response – and those reactions are consistent with their overall personalities. For example, consistent quiet repetition relaxes Tally, but simply bores Coffee, who will then seek his own entertainment. The end goal is not to change or squash the personality of the individual horse, any more than you would want to squash your child’s personality. But understanding whether your horse is a warrior, a scaredy cat, or a clown, will help you approach their training in a way that gives them the best advantage. 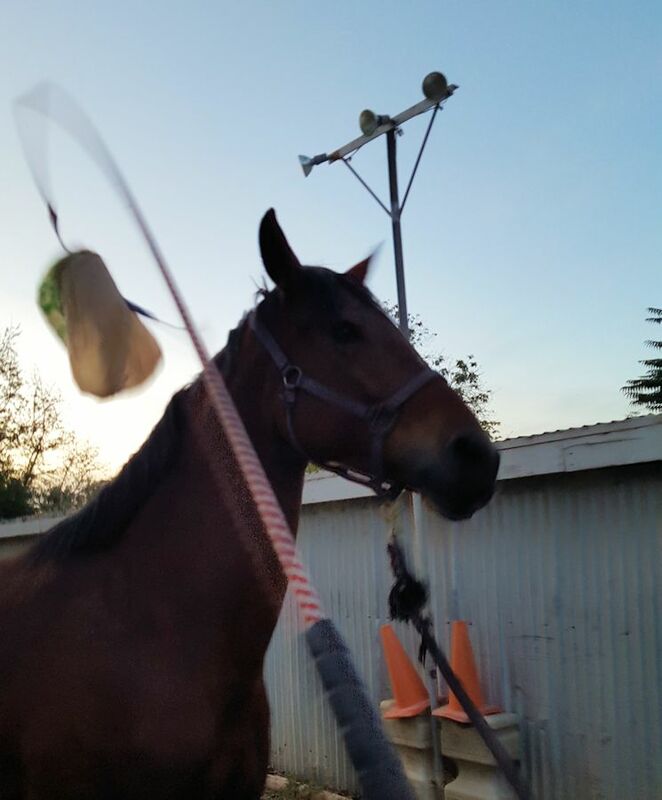 This entry was posted in Just For Fun and tagged bag goblin, bravery, carrots, class clown, Coffee, desensitization, flight instinct, Nash, Noble, personalities, positive reinforcement, Tally, warrior. Bookmark the permalink.